"Delineator" redirects here. For the fashion magazine, see The Delineator. "Reflective road marking" redirects here. For reflective painted lines, see Road surface marking. The orange markers separate opposing traffic lanes. The blue marker denotes a fire hydrant on the left sidewalk. The surface of this type of vibrating coating line is distributed and scattered with raised bumps. Some bumps are coated with high-refractive-index glass beads. When a speeding vehicle runs over the raised road lines, it produces a strong warning vibration to remind the car driver of deviation from the lane. Perpendicular to driving directions, these marking lines are used for settled mainline toll plaza, ramp entrances, mountainous areas, continuous sharp turns, downhill sections and the end of the highway (intersection of highway exit and the plane of the common roadway), gates and entrances of enterprises, institutions, and school. In the same direction of traffic driving direction, they are mainly settled in the median strip, edge lines, and dangerous sections of the road. In the United States, Canada, and Australia, these plastic devices commonly have two angled edges facing drivers and containing one or more corner reflector strips. In areas where snowplowing is frequent, conventional markers are placed in a shallow groove cut in the pavement, or specially designed markers are used which include a protective metal casting that is embedded in recesses in the pavement, allowing the marker to protrude slightly above the pavement surface for increased visibility, much like a cat's eye. The marker is generally held in place using butyl pads, epoxy glue, or bitumen. In areas with little snowfall, reflective raised pavement markers are applied directly on top of the road surface rather than being embedded in the surface. The device's retroreflective surface enables the device to be clearly visible at long distances at night and in rainy weather. The devices come in multiple colors which vary in usage depending on local traffic marking standards. In almost all European countries, such markers will include reflective lenses of some kind. Most appear white or gray during daylight; the colors discussed here are the color of light they reflect. Because of their inconspicuousness during the day, they are always used in conjunction with painted retro-reflective lines; they are never seen on their own. White markers — for lane markings. When used on dual carriageways, motorways or one-way roads, they may illuminate red on the reverse, to indicate drivers are traveling the wrong way. Yellow or amber markers — These are found next to the central reservation (US: median) on motorways and dual carriageways and, in the Republic of Ireland, are also used on hard shoulders. Green markers — These are used where slip-roads (US: off-ramp) leave and join the main carriageway on dual carriageways. In some countries, they are also used across the entrances of minor roads or accesses onto major single carriageway roads. 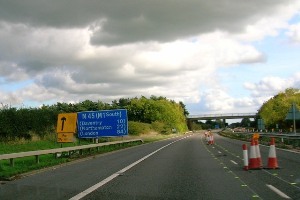 Blue markers — Are used to indicate the entrance to police reserved slip-roads (these do not lead anywhere, they are to allow police to park and monitor motorway traffic). Fluorescent yellow markers — These are used to indicate temporary lanes during roadworks on major roads and are glued to the road surface; they are never embedded in it. Any painted markings will be removed from the road surface if they contradict the markers. They are fluorescent yellow in color, so they stand out in the day, but reflect white light at night. Where used, they are much more numerous and dense than standards markers, as they are not used in conjunction with painted lines. White markers — for lane markings or to mark the right pavement edge. Yellow or orange markers — These separate traffic moving in opposite directions, or mark the left pavement edge on one-way roadways. Blue markers — Usually placed in the center of the roadway to mark the location of fire hydrants on the shoulder or at the curb. Green markers — Usually used to indicate that emergency vehicles can open gates to enter a gated community. Red markers — Usually indicate areas that are closed to traffic. White and red or yellow and red — white or yellow for normal use in one direction, and red to indicate "do not enter" or "wrong way" in the other direction. Red-Clear Markers are primarily used to warn motorists they are going the wrong way; most people have never seen these because they show clear when approached in the correct direction, and only appear red to wrong-way drivers. White and black — white for marking lane restrictions (such as an HOV diamond) in one direction on a roadway that has "reversible" traffic flow, and black in the other direction when the markings do not apply. 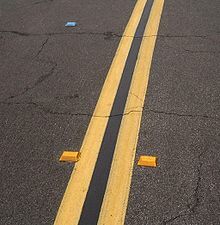 The current trend for lane markings is to intersperse retroreflective paint lines with reflectors as seen on the majority of American highways. 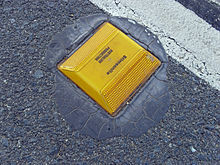 Yellow — In addition to marking the median of freeways, in Victoria single yellow reflectors are used with broken yellow lines to denote tram tracks on which motorized traffic can drive, and double yellow reflectors are used with solid yellow lines to denote tram tracks on which motorized traffic may not drive other than to cross. Cat's eyes were the earliest form of retroreflective pavement markers, and are in use in the United Kingdom and other parts of the world. They were invented in the United Kingdom in 1933 by Percy Shaw and patented in 1934 (UK patents 436,290 and 457,536), and the United States in 1939 (US patent 2,146,359). On March 15, 1935, Shaw founded Reflecting Roadstuds Ltd, which became the first manufacturer of raised pavement markers. The designs now used widely throughout the United States didn't appear until more than a decade later. They are based on the invention of an engineer Sidney A. Heenan in the course of his employment with the Stimsonite Corporation in Niles, Illinois. Heenan filed an application for a patent on October 23, 1964. Patent No. 3,332,327 was subsequently granted on July 25, 1967. Practical use of Heenan's invention was not realized until an abrasion- and the impact-resistant coating was invented by engineer Ramon J. Ascencio of the Stimsonite Corporation, working with the original team. Ascencio et al., filed an application for patent April 20, 1977, which was subsequently granted under Patent No. 4,596,622 on June 24, 1986. 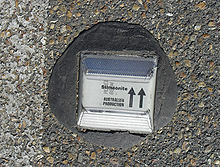 Stimsonite went on to become the leading manufacturer of raised pavement markers in the United States and was acquired in the mid-1990s by Avery Dennison Corporation. For about a decade, Avery sold Stimsonite's line under its Sun Country brand. In 2006, Avery sold its raised pavement marker division to Ennis Paint, one of the largest manufacturers worldwide of paint for pavement markings (particularly lane markings). The company (based in Ennis, Texas) changed its name to Ennis Traffic Safety Solutions and now markets the Stimsonite product line (and descendants) under the Stimsonite brand. Other manufacturers of retroreflective raised pavement markers sold in the United States under various designs include 3M, Apex Universal, Volume, and Ray-O-Lite. Glass road studs have a very special shape: the upper half is a dome shape, and the lower half is a base covered with a reflective layer. They come in a variety of colors and sizes to meet the requirements of different applications. Currently they are widely adopted in Taiwan and around the world. 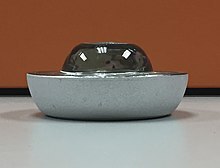 Cat's eyes, in their original form, consist of two pairs of retroreflective glass spheres set into a white rubber dome, mounted in a cast-iron housing. They generally come in a variety of colors. They have enjoyed widespread usage in the British Isles and elsewhere around the world. Nonreflective raised pavement markers (also known as Botts' dots) are usually round, are white or yellow, and are frequently used on highways and interstates in lieu of painted lines. They are glued to the road surface with epoxy and as such are not suitable in areas where snow plowing is conducted. They are usually made out of plastic or ceramic materials. A Toucan crossing with markers visible. In this case thermoplastic paint has been used. In the UK, the area in which pedestrians should cross at pelican crossings is marked out by a series of markers. 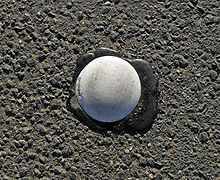 Usually, these are painted as squares on the road but occasionally a metal stud is used. These are usually square and made from unpainted steel or aluminum. Delineators are tall pylons (similar to traffic cones or bollards) mounted on the road surface, or along the edge of a road, and are used to channelize traffic. These are a form of raised pavement marker but unlike most such markers, delineators are not supposed to be hit except by out-of-control or drifting vehicles. Unlike their smaller cousins, delineators are tall enough to impact not only a vehicle's tires but the vehicle body itself. They usually contain one or more retroreflective strips. They can be round and open in the center or curved (45-degree sections) of plastic with a reflective strip. They are also used in low reflective markers in a "T" shape. They can also be used to indicate lane closures as in cases where the number of lanes is reduced. The name "delineator" is also used for reflective devices attached to other objects which are technically not pavement markers. ^ "Convex Vibration Road Marking Paint". 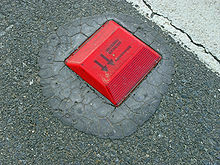 ^ "Reflective Pavement Marker | Florida Transcor". fltranscor.com. Retrieved 2017-03-15. ^ "Road Infrastructure & Technology" (PDF). wtbooks.com.